It says that there can only be 10 installations with the Enterprise package. What does that mean? On one website? A: It means one can install the app. into 10 computers at the same time. 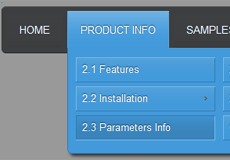 There is no limit for insertion of CSS3menu into the site. Hi, If I have to re-install the application on the 2 machines covered by the license because of rebuilds, will it say that it has been activated more than the allocated amount of times? Hello. I purchased a commercial license of CSS3Menu for my office computer but I need to install it on a second PC. September 29, 2013 Is simple css dropdown menu license for life long or for specific period? I have bought CSS3menu with MegaBundle. Dear Support, If I purchase a license, will it expire? Is this is a life-time term, or do I have to renew every year? The purchase says 'auto-renewal', this is why I am wondering. Dear support, I would like to order your CSS3Menu. How do I order and can I get a hard copy of application on a DVD? August 28, 2012 How many installations does css menu license allow? September 13, 2013 How many installations does css menu license allow? I purchase WOWSlider already and I will buy CSS3Menu in a few days. How many installations does one license allow? I can't find this information. Dear Support, I developed a menu for my web page.